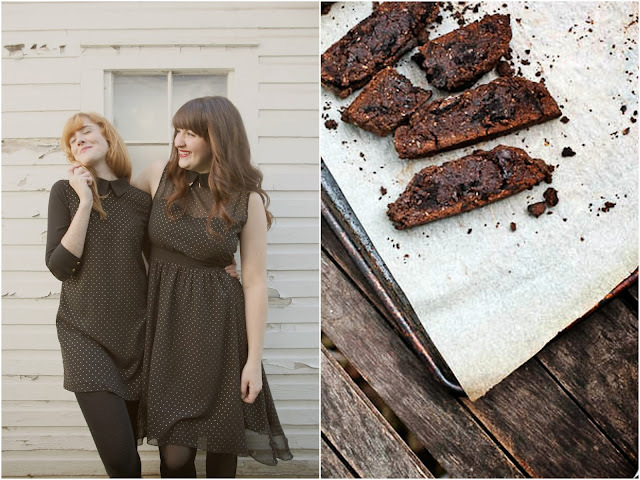 Kelly sent this back our way, a picture of her whole wheat triple chocolate biscotti. I think a cookie recipe featuring oreos is so perfect for such a sweet pics of two best friends. Can't you just imagine them dunking these in a great big glass of milk? Kelly's eye for detail thought the biscotti brought out the colours in the dresses, which we agree, even down to the baked parchment paper picking up on the colour of the wood siding of the house behind the girls. Here's the recipe! I will give a special treat to anyone who brings some of these in while I am working, kay? In a large bowl, whisk together the flours, baking soda, salt and cocoa. Set aside. In a smaller bowl, whisk together the butter, vanilla, eggs. Pour the dry into the wet ingredients along with the oreo crumbles and chocolate chips and stir until a dough forms. Use your hands to finish mixing. It will be somewhat tough, add a few tbsp of water or milk if it’s a bit dry. Split the dough into two equal portions and form each into a wide, flat log about the length of a mini-baguette (about 1.5” in height, 8” in width). Place the logs on a parchment lined cookie sheet and bake for 20-25 minutes or until the dough feels hard to the tough. Remove from the oven and let cool for 15 minutes. Slice the logs diagonally (crosswise, not lengthwise) into 1” cookies. Place back on the parchment paper and bake for 8-10 minutes on one side, flip and bake another 5-7 minutes until the cookies are nice and firm. Let cool and enjoy!